Neurons depend on long axons to communicate with target cells. Neurons in the brain and spinal cord have almost no ability to regenerate axons that are disrupted by injury or disease, resulting in a devastating and permanent loss of function. On the other hand, many other types of neurons, including peripheral neurons, neurons in lower vertebrates, and embryonic neurons, can regenerate their axons robustly. What mechanisms allow regeneration in some types of neurons but prevent it in others? 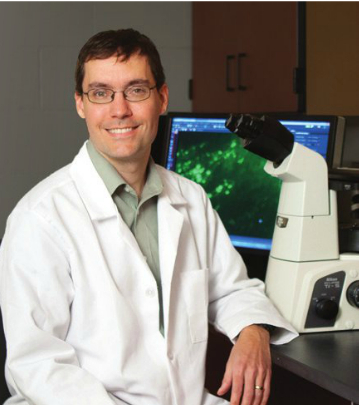 The goals of Murray’s research program are to 1) identify genes that explain differences in regenerative ability between different types of neurons and 2) manipulate gene expression in neurons to promote regenerative ability. To do so, he compares gene expression in regenerating versus non-regenerating neurons, and then tests the activity of differentially expressed genes in culture assays of axon outgrowth. Then, using viral-mediated gene delivery in a rodent model of spinal cord injury, he tests the strongest candidate genes for the ability to promote axon growth in living animals. Ultimately, Murray’s lab aims to develop gene therapies to promote the regrowth of axons in the injured spinal cord and brain.